Aberdeen's Kenneth McLean bringing the curtain down on his Pittodrie career in style. 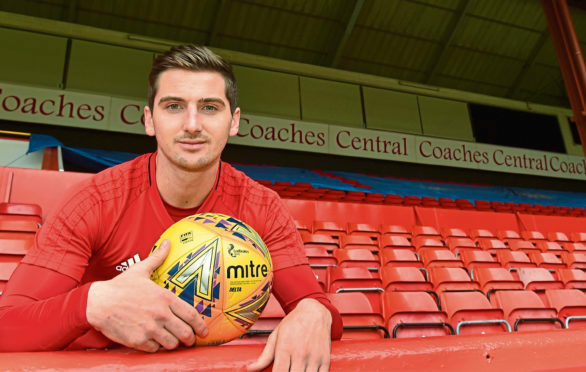 There would be no finer way for Kenny McLean to bring the curtain down on his Pittodrie career than with a win over Rangers. The Aberdeen midfielder plays his last home game tonight before moving to Norwich in the summer and feels a win over the Gers, which would all-but secure European football for the Dons, would be the perfect send-off. McLean sealed his move to the Canaries in January but remained on loan with the Dons until the end of the campaign. He has arguably been their best player over the course of the season, and said tonight promises to be an emotional one as he bids farewell to Pittodrie. He said: “There wouldn’t be a better way to bow out of Pittodrie, I think, than by beating Rangers. “But it’s all about the team, all about getting the three points we need to put us in a really strong position. We’re looking to win both of our remaining games and it’s still in our hands to do that, to finish in second place. “It’s been an excellent three-and-a-half years here, so it will be emotional for me. I’ve thoroughly enjoyed my time here at Aberdeen. I’ve grown as a person and improved as a player – and that’s what I wanted, coming here. “I wanted to take my name to the next level, which I think I have. I’ve set myself up nicely for a new chapter in my career. At Carrow Road he will join up with former Aberdeen team-mate James Maddison, whose career has gone from strength to strength since returning to Norwich from a loan spell with the Dons. McLean has been in regular contact with Norwich since signing. He said: “There are loan managers at Norwich who I will speak to on a regular basis after games. They will tell me how my game is and I will tell them how I feel I’ve done. That’s what I need to be doing. “It’s all about Aberdeen, it’s all about getting the next two results. Victory tonight would take them four points clear of Rangers, who are under the stewardship of Jimmy Nicholl and Jonatan Johansson for the final three games of the season before Steven Gerrard takes over on June 1. The news of Gerrard’s appointment only serves to increase the attention on this game, with a chance for Aberdeen to end their Old Firm hoodoo this season with so much riding on the outcome. McLean added: “There might be more attention on this. But we still need to look after ourselves. “What happened last week will give Rangers a lift, I’m sure. But we can’t influence what happens in their changing room. “We know we’ve got the squad, know we’ve got the quality, that can go out there and get the result for Aberdeen. “It’s been thrown at us a few times that we have a mental block. I don’t think it’s true. But I can see why people would think that. I just think it’s been down to us not performing against Rangers on the day. There have been other games, against other teams, when we’ve done that and still got the result. We’ve not been good enough against Rangers, we know that. “We’re going out tomorrow for three points. Nothing less.